No sign of a 1949 presidential address, so I move on to the 1950 address delivered by Philip C. Brooks at the Society of American Archivists (SAA) meeting in Madison, Wisconsin, in October 1950. Brooks served as the first secretary of the SAA (1936-42) and as its seventh president (1949-51). His early work with the National Archives helped to shape the records management policies and procedures of that organization. Brooks also served as the first director of the Harry S Truman Library (1957-71), and his papers are housed at that presidential library. His presidential address was published in American Archivist in January 1951. Brooks began by reflecting on what sort of address he should give. He referenced the “crisis call” addresses delivered by Waldo Leland in 1940 and 1941 but ultimately likened his address to a “cadenza in which the speaker is bound by no rules of composition, can be highly personal, and can be entirely irresponsible to any party line in expressing his own views” (34). Using a musical term that has the connotation of improvisation perhaps helps to explain the free-flowing style Brooks employed in this address. He spoke briefly of the qualifications for membership in SAA and then segued into a discussion of terms that are problematic in their definitions. Specifically, he cited “archives” as a term “used loosely and with confusing variation” (35). (I shudder to think what Brooks would think of the multitudinous and disparate uses of the term archives today.) He also took issue with the term historical being too loosely applied to archives, instead pointing out the other types of research that take place in archives, including “uses for administrative precedent, government research, economics, sociology, scientific development, and other lines of investigation so numerous as to evade logical classification” (35). “We must remember that archivists have entered the records administration field because economical administration of records at all stages is closely akin to the specialized activities of archivists, and because the results of good or bad records administration affect the kind of job that archivists can later do with the records” (39). Brooks briefly reflected on the training required for archivists, though he mainly deferred to the work already completed on this subject by Ernst Posner. In discussing whether the discipline of history is important to the training of archivists, he concluded, “Archives at once are derived from history and serve the study of history” (43). Perhaps the most interesting commentary by Brooks was about what was not being emphasized in archival training — specifically, analysis and description. He suggested that seemingly making these the afterthoughts of the profession severely compromised the ability of archives to publicize their holdings and appropriately serve researchers. “I believe that the study and teaching of history, interpreting history broadly as the knowledge of all phases of human experience, is among the highest realms of cultural activity; and that it cannot proceed without evidence. I believe that in preserving the evidence and promoting its effective use archivists and their colleagues have a role to play of which we can be justly proud” (45). Having found no record of a presidential address at the 1947 meeting of the Society of American Archivists (SAA), I will proceed to the 1948 meeting that took place in Raleigh, North Carolina. Christopher Crittenden delivered his presidential address at this October meeting, and it was published in the American Archivist in January 1949. Crittenden’s 1947-49 tenure as SAA president came during his long career as the head of North Carolina’s state historical agency — succeeding Albert Ray Newsome as secretary of the North Carolina Historical Commission in 1935 and continuing his leadership when the agency was recast as the Department of Archives and History in 1943. He stepped down in 1968. “He should offer the most effective service possible to other agencies of the government, to unofficial organizations, to private researchers, and to the general public. If he performs this function and does it well, he need not concern himself about questions of prestige or of professional standing, for such matters will take care of themselves” (8). It’s possible that I’m drawn to the wisdom of Crittenden because I can walk outside my office and thumb through his bound volumes of the American Archivist. But I also happen to think that he was right to force the archival community to widen its notions of the community to whom and for whom we are responsible. Once again, I’m skipping a year in our review of Society of American Archivists (SAA) presidential addresses. As with the 1943 meeting, I find no evidence of a presidential address in the published notes from the November 1945 meeting. So that brings us to the October 1946 meeting in Washington, DC, where Solon J. Buck, the second Archivist of the United States (AOTUS), delivered his address at the tenth annual SAA meeting. This address was published in the American Archivist in January 1947. Buck succeeded Robert D.W. Connor in 1941 and served until 1948, when he moved to the Library of Congress. Buck’s tenure as AOTUS spanned U.S. involvement in World War Two, and this address reflected the impact of that conflict. Buck began with an expansive view of the role of archivists — beginning with the premise that in 1946, “in the place of the multitude of distinctive tribal, racial, and national cultures of earlier times, mankind possesses one human culture or civilization, with many local variants and adaptations,” and going on to suggest that documentation was the prerequisite for the development of civilization (9). Just in case people weren’t quickly following his point, Buck tagged librarians, archivists, museum curators as “documentalists” who preserve and provide access to recorded ideas (10). There needed to be an international archives agency. There needed to be an international archives association. Some of these goals will take a while to accomplish, but part of Buck’s dream was realized in the United Nations Archives and Records Management Section, an idea that was born in April 1945 at the San Francisco conference and culminated in 1949 when the organization became the custodian of records not only for the United Nations but for its predecessor agencies, including the War Crimes Commission. “The only true fortresses in these times are fortresses of the mind. They cannot be built in a day. It is my belief that they will be built, as they always have been, on the foundation of the reservoir of recorded ideas that, constantly supplemented by new ideas, makes civilization possible” (24). Having found no evidence of a presidential address delivered by Robert D.W. Connor at the November 1943 annual meeting of the Society of American Archivists (SAA), this week I bring you Margaret Cross Norton’s address from the November 1944 SAA meeting at Harrisburg, Pennsylvania. This address was published in the American Archivist in January 1945. By this point, Norton was more than 20 years into her 35-year tenure as the first superintendent of the Illinois State Archives. Throughout her career, she emphasized the importance of the legal and administrative values of government records. Norton was recognized as a leader; she was the first female president of SAA, and there wouldn’t be another woman as president until 1959. Her work in Illinois became a model — even to the extent that in World War Two, if the nation’s capital ever had to be evacuated, the plan was to send the treasures of the National Archives to the Illinois State Archives Building that had been built to Norton’s specifications. there should be open access to government records, “except where the law specifically exempts certain records from public inspection as being of a confidential nature” (7) — Norton also pointed out that allowing such access requires attention to undue wear on the documents and to their possible theft, so much so that creating access copies is probably worthwhile. governments should have plans in place to reconstruct public records that might be destroyed through some sort of catastrophe — no doubt after the 1871 Chicago fire, the people of Illinois were especially primed to focus on this issue. One solution she highlighted that could address this need is microfilming, though she did argue that there needed to be more attention given to the certification of microfilm as acceptable copies. Norton elaborated on the issue of the destruction of government records, making two interesting points. First, she acknowledged that records are often destroyed without authorization, arguing that “the law is impracticable because it fails to give an adequate definition for the term ‘records'” (6). She established an outline for a functional approach to determining the retention of government records. Secondly, Norton pointed out that records are often not turned over from one government official to the next, so she suggested there be a process by which an inventory would be compiled and a receipt provided among the predecessor and successor to a government post. Robert Digges Wimberly Connor delivered the presidential address at the sixth annual meeting of the Society of American Archivists (SAA) in Richmond, Virginia, on October 26, 1942. This address was published in the American Archivist in January 1943. Connor’s 1942-1943 tenure as SAA president came soon after his resignation as the first Archivist of the United States (AOTUS). 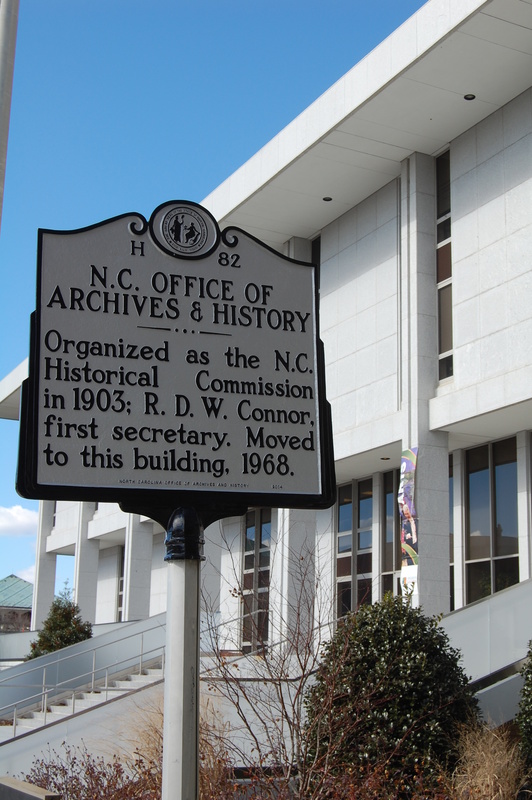 Before making his mark as the first AOTUS, Connor helped to establish the North Carolina Historical Commission, which was the predecessor to the Department of Archives and History. His papers are available at the Southern Historical Collection of the Louis Round Wilson Library at the University of North Carolina at Chapel Hill, where he was a professor for many years before and after his time in DC. be established or maintained in the world” (1). Another memory related to getting early deposits to the National Archives, including from the U.S. Senate, a court, numerous independent establishments, and 10 executive departments, including the State Department and the War Department. Connor mentioned in this context that there was a perceived archives vs. library struggle at the time (i.e., the National Archives vs. the Library of Congress), and he also noted that upon laying the cornerstone of the National Archives, President Hoover stated that “‘the most sacred documents of our history'” — including the originals of the Constitution and the Declaration of Independence — were destined to be housed at the National Archives (10). What Connor failed to explain (though admittedly his 1942 audience likely knew) is that while the Bill of Rights was transferred to the National Archives in 1938, at the time of this address, the Declaration of Independence and Constitution were still housed at the Library of Congress, where they had been since 1921 and would remain until 1952. Ultimately, Connor pointed to a newspaper correspondent who correctly surmised this “struggle” was one that pitted that authority of the executive branch, which oversaw the National Archives, versus the legislative branch, which of course had authority over the Library of Congress. With the transfer of materials from the War Department, the National Archives freed up 136,000 cubic feet of space for which the War Department had pressing need in the midst of World War Two. As a result, the National Archives was designated as an essential defense agency. Connor closed his address with a letter from President Franklin D. Roosevelt, who had been elected an honorary member of the SAA. In addition to recounting his personal interest in records, FDR challenged the SAA to curry favor for creating preservation duplicates of government archives, specifically suggesting that microfilming records and storing that film in another location “might be called the only form of insurance that will stand the test of time” (17). FDR would be happy to know that even in the 21st century, this is still a common practice.